Autumn is a funny time of year in ski country. Anticipation for the upcoming winter builds into a palpable nervous energy, waiting to be released when opening day finally comes. Here on the wet coast, miserable fall weather adds to this anxiety, though this year the cruel irony of unusually clear skies is making ski bums nervous about the coming winter’s snowpack. A snow-lover’s catch 22. Unlike the weather, you can rely on the yearly onslaught of ski and snowboard movie premieres that hits ski towns every autumn, drumming up a frenzy (conveniently enough for the films’ sponsors, just in time for the flashy new gear showcased in the films to hit storefronts). Over the last few months Whistler has seen several new films, all selling out multiple screenings, but the most heavily anticipated is yet to come. In two days I will attend the Whistler premiere of Deeper, the brainchild of Jeremy Jones, hands-down the world’s top big mountain snowboarder, along with a slew of fellow mountain slayers. Aside from the top-notch talent, what sets Deeper apart is the story it conveys. In a dramatic departure from other mainstream ski movies (including Jones’ previous film segments), all of the action in Deeper was accessed without the aid of helicopters or snowmobiles (check out this “behind the scenes” article). This low-carbon approach reflects Jones’ environmental beliefs (in 2007 Jones founded the climate change advocacy foundation “Protect Out Winters“), but the idea for a fully self-propelled snowboard movie also draws from an evolution in Jones’ approach to snowboarding, inspired by the sports’ international roots. In this latter respect, Deeper is a microcosm for recent developments within the global skiing/snowboarding community: a convergence between two distinct big-mountain cultures that has become a driving force behind the sport’s’ continued progression. A new era in skiing was born in 1967 when Swiss mountaineer Sylvain Saudan completed the first ski descent of the Spencer Couloir above Chamonix, France, earning him the nickname “Skieur de l’Impossible.” Soon more ski-mountaineers like Patrick Vallencant, Jean-Marc Boivin, and Anselme Baud were tackling increasingly steep, technically challenging mountain faces and the sport of extreme skiing was born. Death, for these extremists, was a fact of life. On most of these lines falling was not an option, so the skiing, like climbing, was slow, methodical, precise. The mountaineers’ skills and ethic of self-reliance continued to be revered. Video 2: First descent of the Arête de Peuterey, on Mont Blanc, France by Patrick Vallençant and Anselme Baud in 1977. A few North Americans ski mountaineers such as Bill Briggs would perform similar feats, but this brand of extreme skiing never became as popular, nor drew as much media coverage, as it did across the pond. In the 1980s, skiers such as Doug Coombs, Trevor Peterson, and Eric Pehota–all ski-mountaineers at heart–began experimenting with a new approach to the mountains they loved. 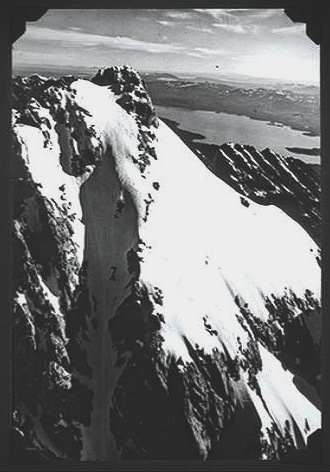 The iconic 1971 photograph of Bill Briggs ski tracks on the summit of Wyoming's Grand Teton, captured from a plane a few days after Briggs' un-filmed descent to quell disbelief. At that time the American ski industry was in a period of growth, increasingly propelled by athlete-driven marketing based on action photography and filmmaking. Flush with corporate cash, film crews increasingly used helicopters to film in remote and dramatic mountain settings away from traditional ski areas. With its unique combination of the imposing Chugach Mountains’, extraordinarily stable coastal snowpack, and overwhelming aura of wilderness, Valdez, Alaska became the mecca of North American extreme skiing, just as Chamonix, with its endless couloirs and deep mountaineering lore, was Europe’s. Meanwhile, helicopters freed the athletes from many of the constraints of the mountaineering approach: fatigue, prolonged exposure to avalanches, heavy packs, and specialized ski gear that had to perform as well on the way up as it did coming down. Ski-mountaineering traditionalists, meanwhile, contended (and still contend) that helicopter-assisted skiing was a hollow victory. Such technological shortcuts severed the visceral connection between man and mountain which was essential to the ski-mountaineering experience. While the ski-mountaineering purists progressed towards increasingly steep, hazardous, complex routes, freeskiers (as they came to be known) descended slightly less technical lines–coated in powder snow, preferably–but with far greater speed and fluidity. The greater influence of snowboarding in North America is evident, especially once aspects of freestyle riding developed in terrain parks began to be applied to natural terrain. Video 3: The groundbreaking segment by Johann Olofsson (my favourite snowboarder growing up) in the 1996 snowboard film TB5. Filmed primarily in California’s Sierras and Alaska’s Chugach Range. Video 4: The cutting edge of freesking: Eric Hjorleifson’s segment in Seven Sunny Days (2008). Most of the filming was done with helicopters or snowmobiles, but shots where he’s wearing a backpack were accessed on foot (they even show a few short clips of him ski-touring). Throughout the 1990s and early 2000s these two extreme skiing sub-cultures progressed in parallel but remained relatively isolated (with notable exceptions). In recent years, however, growing concern for climate change, massive improvements in backcountry ski gear, and the forces of globalization have led to the growing integration of these trans-Atlantic counterparts. Video 5: A more contemporary look at European ski-mountaineering that highlights some of this convergence among the latest generation of skiers. Courtesy of the good folks at doglotion.com (who also happen to be putting on the Whistler premiere of Deeper). I am particularly interested in this phenomenon because I see myself within it. After several winters freeriding in western Canada, four years ago I spent a season in Chamonix to experience new mountains, but also to learn about ski-mountaineering techniques in the sport’s birthplace. The next summer I returned to Canada with a broadened perspective and greater appreciation for the mountains, and anxious to apply my new knowledge in British Columbia’s Coast Mountains. Once Jeremy Jones committed to climbing every line he rode, he explains in the trailer for Deeper, “it opened me up to a whole new world of mountains.” In Deeper, Jones fully embraces the ski-mountaineers’ ethic; his personal commitment has become much greater–in terms of time and energy expended, as well as exposure to physical risk and all the emotional fireworks that that entails–without the conveniences and safety net of helicopters. Each descent, has become a process, rather than a stunt. Judging by the trailer, these added challenges haven’t toned down the end product. Climbing straight up massive Alaskan spine lines, charging down ski-mountaineering classics in the Alps, and testing new frontiers in Antarctica, Jones and co. are pushing multiple envelopes on the biggest and baddest mountains on Earth. By slowing things down a little, they’re getting more extreme than ever. Does this look like globalization to you? Jeremy Jones' caption for this behemoth mountain face says it all: "Chamonix breeds with Alaska and has a kid in Antarctica."